He completed his schooling from St Josephs Academy, Dehradun. He is a CCRT Scholarship holder since 2012. He has been ranked No.1 in the State of Uttarakhand and No.7 in India. He is also a Sangeet Natak Academi awardee in Kathak Dance. 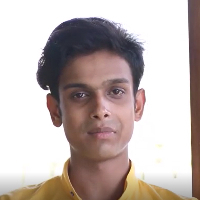 He attained his Visharad in Kathak from Bhatkhande Sangit Vidyalaya, New Delhi. He also trained under Kathak Gurus namely, Mr. Rajendra Gangani as well as his father, Late Dr. Madhukar Anand, and grandfather, Pandit Balram Lal. He is currently training under Pandit Birju Maharaj. The very meaning of the word Kathak, is to tell a tale. It is a tale that is expressed not through books but through the various body movements and expressions of a kathak dancer. Kathak is not just a subject it is a form of expression. "I attended and finished school at St Joseph's Academy, Dehradun. I am a CCRT Scholarship holder since 2012. I am also a Sangeet Natak Academi awardee in Kathak Dance. I attained my Visharad in Kathak Dance from Bhatkhande Sangit Vidyalaya, New Delhi. I am currently training under Pandit Birju Maharaj."